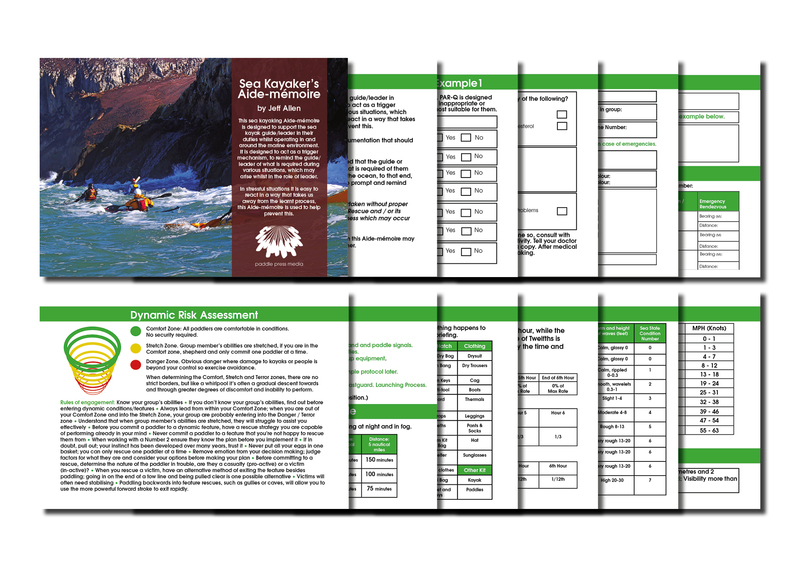 Sea Kayaker’s Aide-mémoire by Jeff Allen - A Paddle Press Media product. 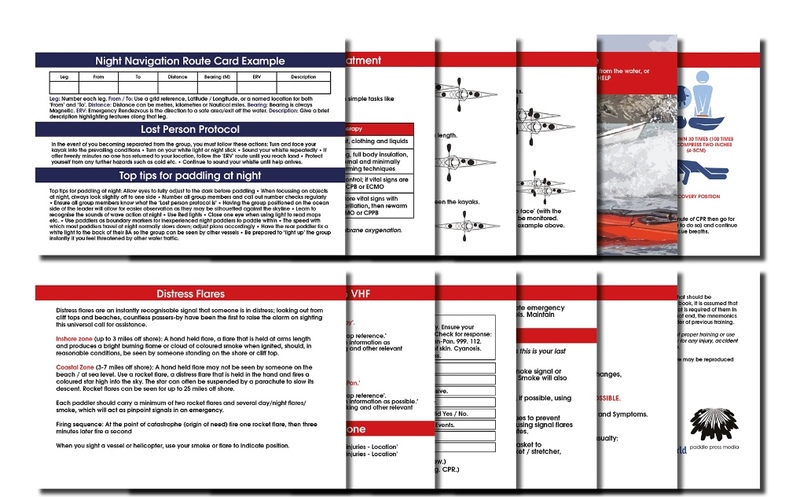 Written by Jeff Allen and printed on plastic, this waterproof A6 Aide-mémoire includes examples of a Physical Activity Readiness Questionnaire, a Float plan, a Leader’s Inventory, a Route Card, a Night Navigation Route Card and a Trauma Patient Handover Tool. Along with many helpful mnemonics and a Speed / Distance Timetable, this Aide-mémoire also covers Dynamic Risk Assessment, Trip Plan Briefings, Tidal Predictions, Wind and Sea Scale, Wind Speed Conversion, Lost Person Protocols and Top tips for paddling at night. This Aide-mémoire also outlines the signs and initial treatments for hypothermia and explains the Heat Escape Lessening Posture. You’ll also have illustrations of Short, Long and Rafted, In-Line Rafted and In-line Rafted with anchor man tows. This Aide-mémoire will act as a reminder should the worse happen and you have to perform Basic Life Support, use Distress Flares and / or make Emergency Calls on a VHF or a telephone. It will remind you how to assess a patient, collect and gather essential information for the Emergency Services and about Emergency Action Plans and Helicopter Protocols. “If things go wrong on the ocean, as they often do, the group leader is under an immense amount of pressure to perform effectively, this Aide-mémoire is designed to help guide the leader through that process. All professional rescue services that perform in extreme situations under pressure have the back up of an Aide-mémoire to support their training - this unique Paddle Press Media product is yours. Sea kayak leaders operate in the most extreme environments, use this Aide-mémoire pre-emptively, as a reminder before going afloat, or refer to it in times of duress." Aide-mémoire author, Jeff Allen. Designed to be carried in a buoyancy aid (PFD) pocket, this Aide-mémoire costs just £19.99+P&P. *Please note that the finished / printed Aide-mémoire will have rounded corners and that each sheet will have a small hole in the top left hand corner allowing you to tie / clip / fasten the pages together, if required.